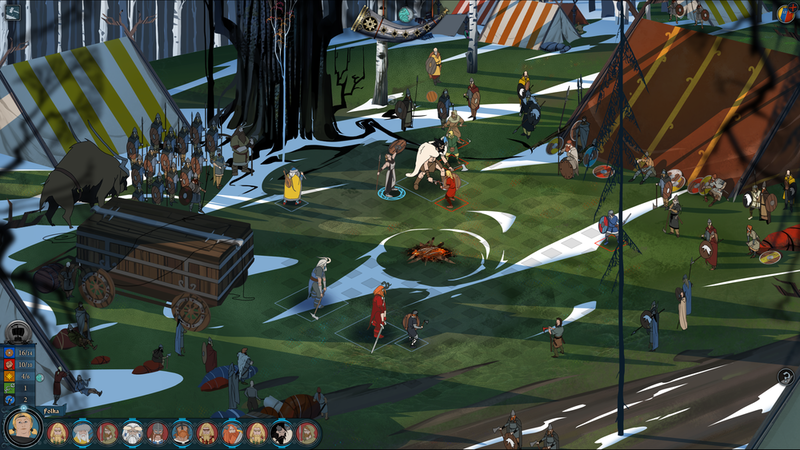 Banner Saga is a tactical role-playing game from developer Stoic Studio. Players take on the role of a pair of characters, each leading a caravan of warriors and refugees across a land inspired by Norse mythology. Initially debuting on PC and mobile platforms - and later on PS4 and Xbox One - Banner Saga has finally come to the Nintendo Switch, four years after its original release. Despite being a four year old game, the innovative combat mechanics, a beautiful art style, and a compelling story all make Banner Saga a worthwhile endeavor, even today. A player who has tried many tactical strategy games would find it easy to assume the gameplay found in Banner Saga. For the most part, those assumptions would be correct, the player sets up his or her fighters on a square grid and takes turns with the computer to destroy the opposing group of warriors. There are a few key differences in Banner Saga, chief among them being a lack of hit chance. Instead of concerning players with hit percentages, the game makes things very simple; if you want to attack one character with another, the attack will land. The one exception is if a combatant is targeting someone with armor greater than their strength. This might seem unfair or too simple, but the addition of armor provides an interesting new wrinkle in combat. Each character has two health values to worry about, the first being armor, where an enemy needs a sufficiently strong attack value to damage your character. This can be reduced with special abilities or even attacks that focus on reducing armor, the latter of which every character can do. The other health meter represents traditional health, but also displays your characters’ strength. It makes sense that a character near death would be weaker than one that is completely healthy, and this adds another layer of strategy to combat. Some characters are better than others at breaking armor, and some special abilities even benefit attacks on armor-damaged enemies. All these factors add nuance to the game, requiring a more diverse lineup of fighters instead of throwing the strongest, tankiest characters into every fight. One of many combat scenarios you'll find yourself in. Additionally, combat is also enhanced by the turn order, in which the player will always alternate turns with the enemy, requiring careful planning to set up more complex attacks. The only exception is when one faction has a single character remaining: they’ll be allowed one more action before the remainder of the opposing faction is allowed to act with all of their characters. Additionally, while some characters take up a single square on the board, there are mountainous characters known as varl that take up a 2x2 space. Taken with abilities that can splash onto adjacent fighters, the placement of your characters becomes more vital than in other games in the genre. All of these differences help Banner Saga appear unique, and keep it fresh and interesting in a genre that’s technically existed for centuries. Outside of combat, the game requires a strategic mindset by giving players a series of events that require them to make tough decisions. As your band of refugees flees from zombie-like hordes of golems, will you stop to celebrate the birth of a child? This decision could bolster morale but would allow the pursuing army to gain ground. Other times, players will be asked to take a side in a conflict, although staying neutral is also a choice. Decisions like these feel appropriately meaningful and help the player empathize and identify with the leader character they’re portraying. Will you steal all the supplies from a village terrorized by an insane militia man, and will you then take him prisoner or allow him to join your ranks? A naive or optimistic player might see the best possible outcome and act favorably, potentially opening themselves to be exploited. Furthermore, characters that are defeated in combat can return in future battles, although they’ll be “injured” unless enough days have passed. With dwindling food supplies, is it worth waiting a day or two to keep your characters in fighting shape, or will it cause starvation and death in your camp? Leadership is never meant to be an easy role, and Banner Saga appropriately paints a stressful picture in their scenarios. Gameplay aside, Banner Saga is a beautiful game with a uniquely hand-drawn art style. Beautiful mountain ranges can be seen in the distance when your caravan is marching, and zooming in allows players to appreciate the details in each locale. Even the sparse cinematics appear smooth and luscious, likely due to the plentiful rotoscoping employed by the game’s artists. Even in combat, your arenas - whether they’re a forest clearing or a town hall - are filled with a “less is more” art style that appears plain, but contains a bevy of small touches to make each asset appropriately comforting or desolate. Scenes of dialogue are a good chance to admire the character art. There are a few minor issues, the biggest being with putting the game and console into sleep mode. When I woke my Switch from sleep mode and re-entered the game, all of the idle animations in a battle seemed to try to catch up from when I initially put the Switch in sleep mode. After an hour of sleep, the game spent a few minutes repeating the same idle shield-bashing sound, ignoring even my attempts to mute the sound in the in-game menu. Eventually the problem solved itself but it was still worrisome to experience. The other major issue was after a battle that saw most of my roster injured, requiring several days of rest. However, when I tried to rest I noticed my supplies wasn’t decreasing at all, which sounds great, except that my characters also weren’t recovering from their wounds. Simply exiting to the main menu and reloading was enough to fix the issue, but I’m concerned it won’t always work. Aside from those problems, the game ran smoothly and seems to be a natural fit on the Switch. At a glance, Banner Saga appears to be yet another tactical strategy game, but beneath the surface lies an amazing game with beautiful music and art to match. Each difficult battle and decision made will help to build a world and a story worth playing through. At 20 USD, Stoic Studio has created what they promise to be the first part of a trilogy - with progress carrying over. Thus far, they have delivered on their promise, with Banner Saga 2 coming to the Switch later this year, and a third entry in the works. If Stoic Studio is able to follow through, they will have created a legendary trilogy in an amazing, haunted world worth experiencing.